Hello! I hope you've enjoyed a nice holiday celebration if there was one where you live. We had a quiet few days at home together, finishing some household repairs and yardwork, with some good relaxation too. The weather has been hot and sunny most days, but we're starting to get cloudy afternoons sometimes, which is a nice relief, and we've had a few storms too. This is probably my favorite part of the summer; the monsoon is just getting started, the later-summer plants (which I like best) are flowering, and the very bright morning sun is starting to wane a bit - enough to be just a little less intense when it comes into my bedroom windows early in the morning. We even have things to eat in our own backyard by this point in the summer; we made refrigerator pickles from our own cucumbers this week, we're getting a few cherry tomatoes every day and we're putting fresh herbs in everything. Yes, this is a very good part of the summer. I've been trying hard to keep crafting through the summer, even on the busy days when we have lessons and library visits and activities. I'm really glad to have a crochet project with small parts right now; I can fit in a Maybelle square or two between outings. My squares are coming along quickly, which makes me very happy. I really think I can have this blanket finished by the time we need one on our bed when the weather turns cool. I'm even thinking ahead to my next blanket already. Can you believe it? After all that hemming and hawing for a year before landing on Maybelle, I'm already thinking about what to make next. I feel reinvigorated about crochet! It's a great feeling. Last week, I felt like doing some needlework in between the Maybelles. For a while now, I'd been wanting to stitch something small, to be displayed in a 4-inch hoop, for my gallery wall in the family room. I planned to recycle a hoop that I already had hanging there as a frame for a piece of fabric I like. I'm falling out of love with my hoop-framed fabric lately, though. I still think it's a lovely look, but I was ready for a change, so I decided to stitch something instead. In my mind, I was picturing a colorful butterfly on black Aida, something that would be bright and cheerful, but small, like a tiny enameled plate. I'd stitched a small pink rose on black for this wall a few years ago, with a similar look in mind. 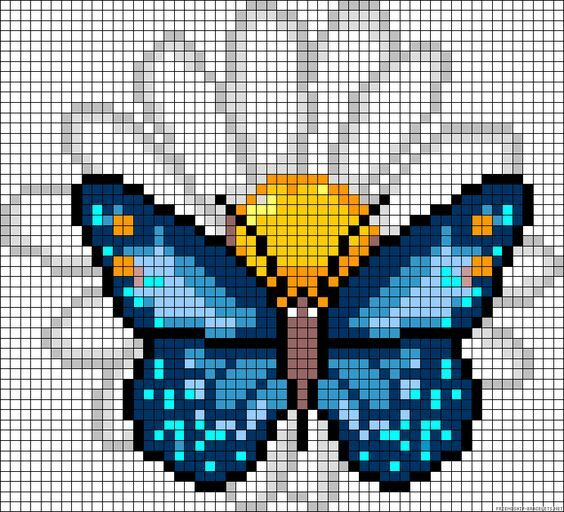 For several years, I've been looking for Perler (or Hama) bead designs on Pinterest, which can easily be turned into cross-stitch patterns (and vice versa!). The GB and I both enjoy using Perler beads and we make all kinds of designs with them. I pinned this butterfly design here, if you're interested in re-pinning. You're also welcome to peruse my Pinterest board for other embroidery designs and patterns, many of which can be used in both cross-stitch and Perler beading. I decided to make this butterfly because it would fit perfectly into a 4-inch hoop. I left off the daisy behind the butterfly; I felt the butterfly alone would be more dramatic against the black Aida cloth. I chose embroidery flosses from my stash, aiming for the same general colors as the design (I love the blues with pops of orange in the wings) but I wasn't fussy about exact shades. To create a physical pattern, I save the design to my computer and print it as a full page. Then I use my Staedtler pens to shade general areas for each color as a guide (my old-school printer doesn't do color, only black and white). I was so happy to be stitching again. I hadn't stitched since just before Christmas, when I finished my Sweetiepie ABC's sampler for the GB. I was really starting to miss it. The butterfly didn't take long - I worked on it on and off for three or four days. I never thought I'd say this, but I really enjoy stitching on black. It takes some getting used to, but it's a fun little challenge for me. In the winter, I stitch sitting in the living room with the sunlight behind me, but in summer I need to sit under the skylight in the family room instead. It's amazing how different the light can be from one season to another. The pattern shows the butterfly outline in black, but that obviously won't work on black cloth, so I outlined my butterfly with white. It was really an experiment, because I wasn't sure if it would look nice at all, but I was pleased with the effect. You can see in this photo how much difference it makes; the butterfly pops even more after outlining in white, I think. I hung the butterfly in the same place where I had the hoop-framed fabric before. I would show you the whole wall, but this day, most things on the wall were crooked and I was too lazy to straighten them for a photo. I'm so happy with my butterfly. I just needed an update. It feels good to have something new, doesn't it? Even a tiny thing like a stitched butterfly can perk me right up. Now I feel inspired to stitch something jazzy for the opposite end of the gallery. I have a pattern in mind already: a big, colorful Polish-style cross-stitch design with flowers arranged in a heart shape. There will be lots more stitchy satisfaction in the near future for me! That's so pretty, love the colors. Do it on black must have been an incredible challenge. It turned out really nice, and I think you are pretty brilliant for using Perler patterns! You are indeed an inspiration using Perler patterns, it looks wonderful on your display wall. Glad to hear about your how well your garden is doing. We are hopeful that we will be able to have a garden planned by next year. Beautiful! I have really enjoyed seeing your living room wall evolve! The butterfly is perfect on that black cloth background, Jennifer! I'm starting to be able to eat things from my garden, and the community garden too now. Isn't it a treat to be able to walk out your door and gather something you've grown yourself? Your butterfly looks wonderful up on the wall. You did a great job and it was fun to hear about how you found the pattern. Hope you continue to have a wonderful summer. Beautiful work and the colors are amazing! Your butterfly stitching is just lovely and looks great on the black fabric. It's been a long while since I worked on black aida. As with black or navy yarn, it makes my eyes a bit crazy. I would need full light to be able to see what I was doing. I've made a few maybelle flowers lately with no real project in mind. Have seen the pattern for the square and might try it out as it seems like something I might could manage. I'm all about simple projects most all the time. :) Have a great week.